There’s a feeling of drastic change this year at the All England Lawn Tennis Club, home to the Wimbledon tennis tournament. Don’t worry, the players are still wearing all white and bowing and curtsying to the Queen. 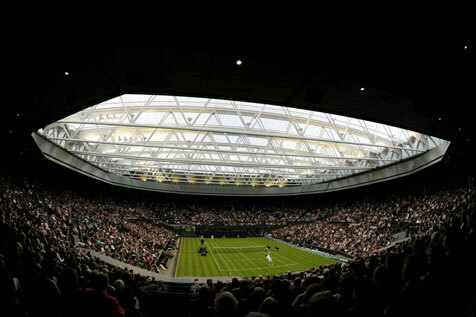 But when one looks upward from Centre Court they’ll see a new translucent, retractable roof, meant to keep away the rain that inevitably delays the matches every year. Designed to close in about ten minutes, the new roof , designed by Populous (formerly HOK Sport; they switched names a few months ago) is constructed of tensile Tenara fabric, which unfolds, accordion-style, across the ceiling. Held up by roof trusses, the fabric has a 40% translucency that lets light penetrate and—vitally— reach the grass below. Working with a system that immediately removes humidity when the roof closes, it seems to be working well. But some wonder if it’s really the same tournament without all the sogginess and with all the high-tech gimmickry. Especially at a place best known for its resistance to change. We don’t know, but we’ll be happy to check it out! Anyone? Anyone?